This Wednesday I attended a meeting with representatives of Presidio County (County Judge Cinderela Guevara and myself), the City of Presidio (Mayor John Ferguson), the Presidio Municipal Development Corporation (Brad Newton), Odessa Mayor David Turner and several reps from Odessa, State Senator Jose Rodriguez, representatives from Texas Pacifico Railroad, reps from the IWBC, District Attorney Rod Ponton, CBP Port of Entry Director John Deputy, members of TXDOT executive staff, TXDOT Executive Director James Bass, Texas Transportation Commission Chairman Tryon Lewis, and Texas Secretary of State Carlos Cascos regarding the long-planned rebuild project of the burned out International Railroad Bridge between Presidio and Ojinaga, Mexico. 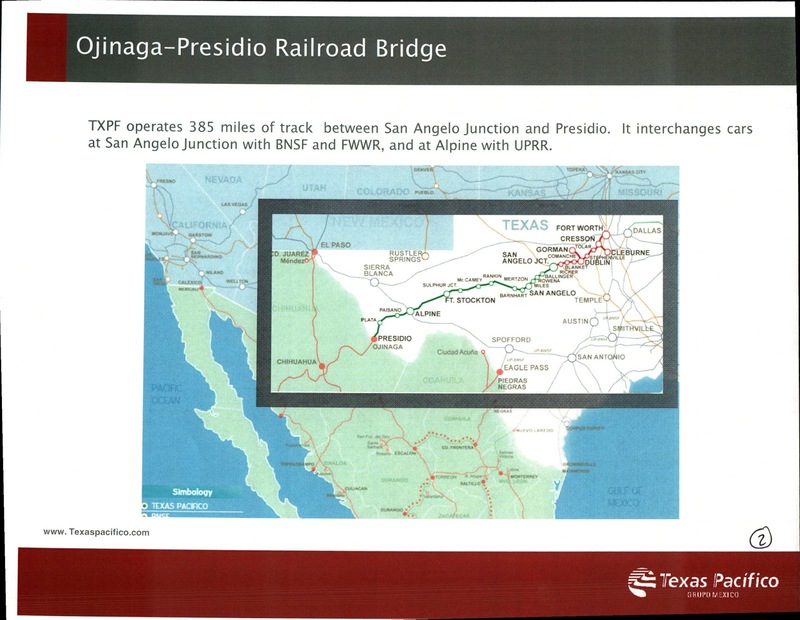 Residents of Presidio and Brewster Counties may know a bit about the South Orient Railroad, which currently runs from San Angelo Junction south 385 miles to the Rio Grande river at Presidio. The line has been mostly unused for many years, and arson at the bridge linking the track to a Ferromex line running all the way through the Sierra Madres to Port Tompoboleo in 2008 put an end to any international traffic. The line functioned as a complete line from 1961 into the 90's but Santa Fe sold out in 1992 and since then the line has not been maintained beyond basic lease obligations. 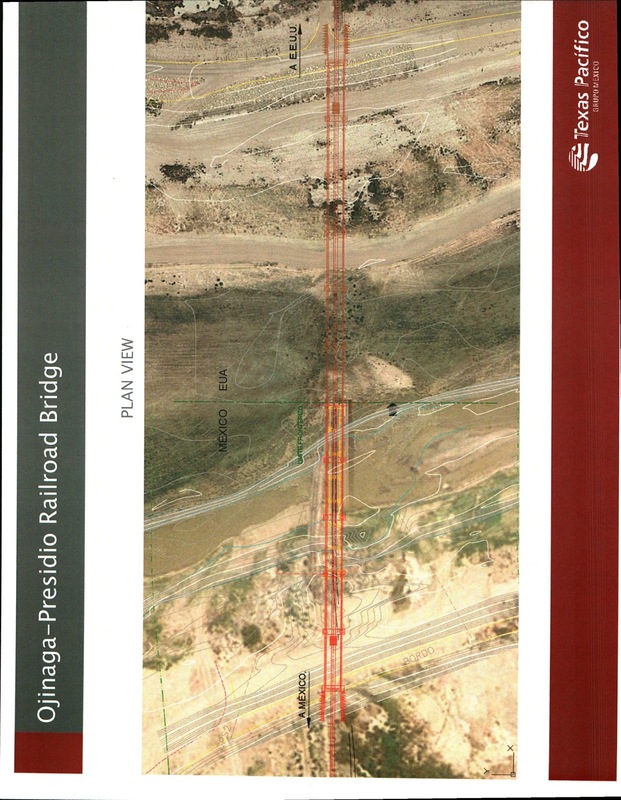 The section between Paisano Pass and Presidio has not been used at all following the staging of the train station scene in "There Will be Blood (2006- on the Mitchell Ranch) up until very recently when some basic maintenance was done in order to transport pipe for the Trans-Pecos Pipeline to the Tinaja region in the last two months. 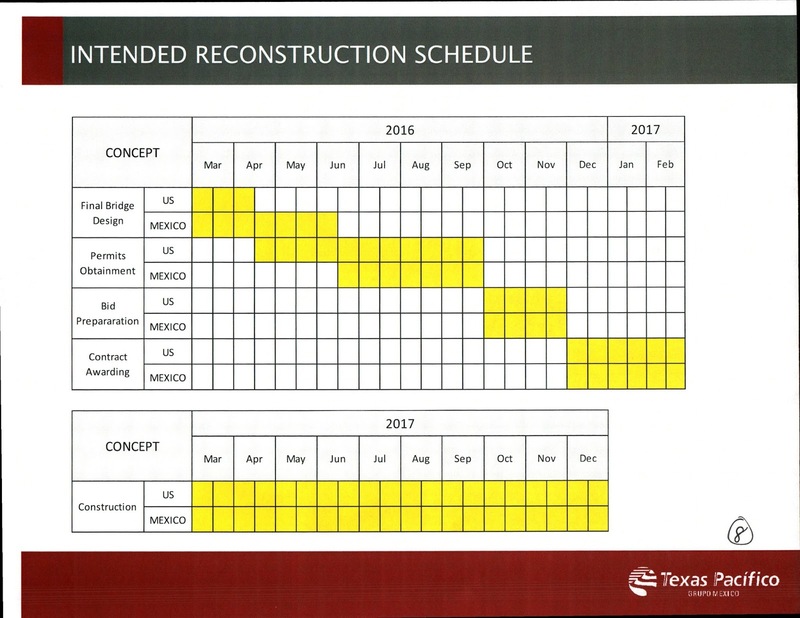 I witnessed some preliminary work being staged further down the line near Casa Piedra in last January, but to my knowledge no actual renovations have taken place beyond the pipeline staging area down Nopal Road south of HWY 67/90. The Texas Dept of Transportation bought the line from the South Orient Railroad Company in 2001 for $9.5 million dollars and has leased the entire line to Texas Pacifico Railroad Company, based in San Angelo and owned by Grupo Mexico, which is the parent company of Mexican railway giant Ferromex. Texas Pacifico has a long term lease and its obligations include keeping the entirety of the line functional to the degree of usage needs. 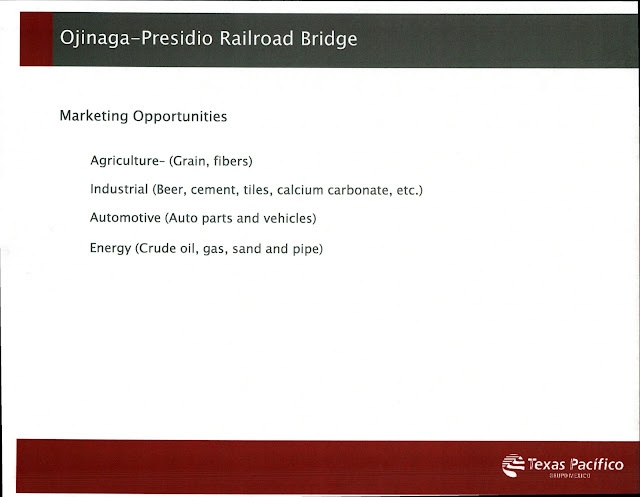 Once the bridge burned in 2008 and was deemed ruined, the future of the line south of Fort Stockton was in jeopardy. 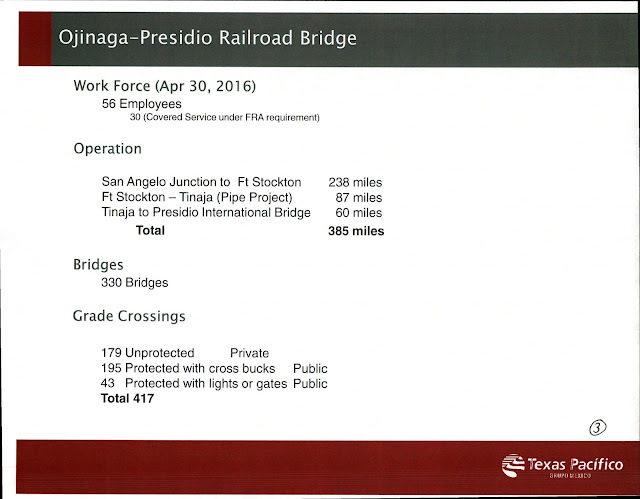 Ferromex owns the rail line south of the Rio Grande. That rail line is still fully operational south of Chihuahua City, and usable from Chihuahua City northwards to Ojinaga, but with very little traffic. The controversial pipeline project has offered a reprieve to the line, and fairly extensive renovations have been made south of Fort Stockton to Alpine. The train is now running occasional loads of pipe to Tinaja, though track speed limits are very low. 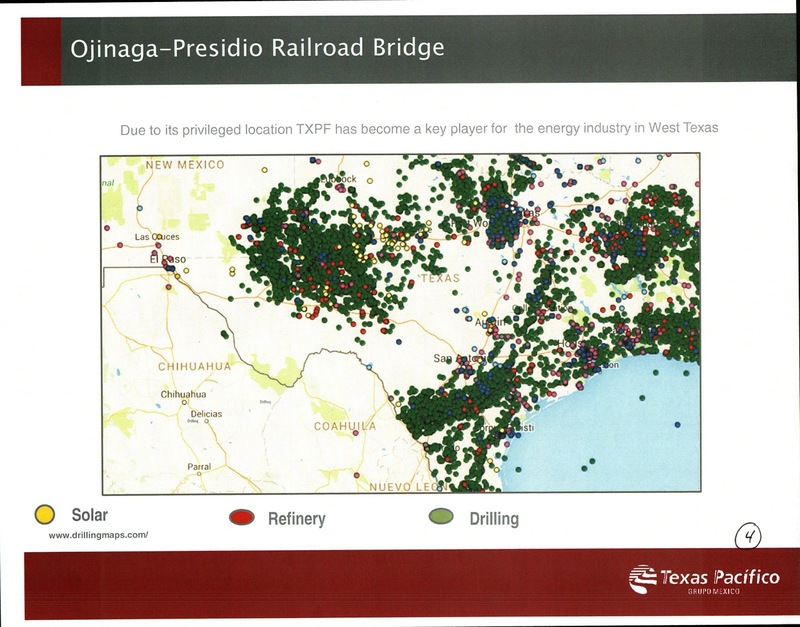 As recently as last summer I had an extensive conversation with a rep from Texas Pacifico where the point was made that even though the company is obligated to rebuild the Texas side of the rail bridge, freight volumes would not be sufficient going into or coming out of Mexico to justify its reconstruction, outside of lease obligations. Of course, the track conditions on both sides continue to deteriorate without any usage or maintenance, furthering the costs and logistical issues of reactivating the line. Although I had been hearing from TXDOT and Texas Pacifico reps that the rail bridge was going to be rebuilt (and it's total height and height of approach on both sides of the river raised due to the raising of the IBWC levees on both sides well over previous track elevation), method of funding and any solid evidence of that was not presented. Yesterday's meeting brought solid enthusiasm, cooperation and real numbers and timelines to the table. TXDOT reps toured the site and expressed confidence in the potential to really bolster trade and industry throughout Texas and Mexico. Customs and Border Patrol director John Deputy went into detail about the Homeland Security requirements, and Texas Pacifico reps announced that they had been meeting with government and industry reps throughout the State of Chihuahua and all the way to Dallas and that the line, once operational, would be busier than originally anticipated. 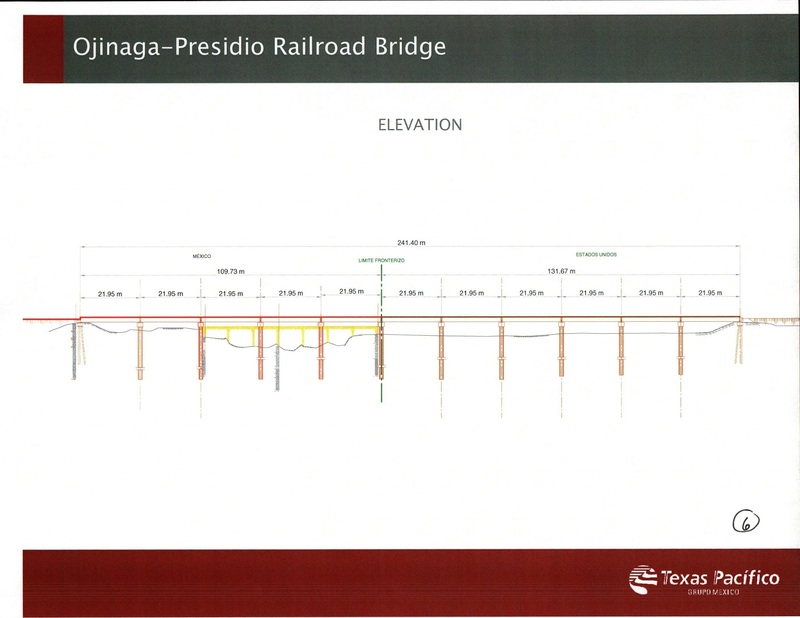 They also announced that after the bridge is completed in late 2017 that they would rebuild the trackage to whatever degree necessary to make it functional for whatever customers can commit to running on it. They also said that regarding funding from the parent company to make this happen, "the sky's the limit" over time. This means that if large industrial customers hauling very heavy freight begin using the line, the tracks could eventually be totally upgraded to a heavier gauge and coupled track could be replaced with more modern and safe welded track. Their attitude towards the required rebuilding of the bridge has totally changed and they seem genuinely bullish on the project. TTC Chairman Lewis was equally excited and he explained that funding for the bridge would come from Texas Pacifico (about $7 million) and funding for fixing the tracks from Tinaja to Presidio would hopefully come from Federal freight rail grants, which TXDOT has applied for and feels good about receiving. Texas Pacifico then presented a powerpoint, which follows here, about their timeline and specs for the bridge, and projected opportunities for freight commodities. They also announced that the engineering for both sides of the bridge is almost 100% complete and that it will be open and functioning by late 2017. Anyway, it was an excellent day, and I will post a few pictures when I am able to get them onto this computer from my phone. We began at the Presidio Airport where the State officials flew in to meet us. From there we went on top of the levee to the site of the old railroad bridge, which will be the site of the new railroad bridge. The old structures, including the concrete bridge on the Mexico side, will be demolished. From there a select group of people who had federal clearance were able to tour the US Customs and Immigration checkpoint. I did not attend as I did not get clearance, having found out about this meeting only a few days prior. The Mayor then showed us through a quick drive through the new Mexico expanded port of entry inspection facility, a behemoth well under construction that will match up to the old U.S. bridge, which will be turned into currently not yet under construction. 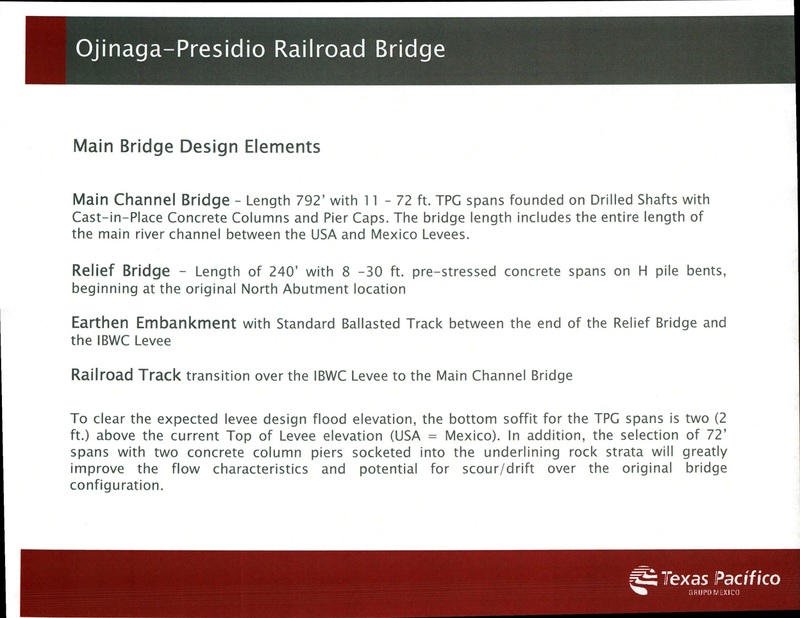 After that we crossed back over into Presidio and went to the PAC for the presentation by Texas Pacifico. Once finished at 3 PM the State Officials went back to their plane and the day, lasting only five hours, seemed like it had been much longer after so much excitement and conversation.